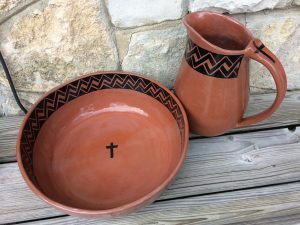 Foot washing basin and large ewer set for Maundy Thursday at St. James Episcopol in Austin. One of a set of 10 basins and 5 ewers. Basins 15″x5″ and ewer 12.5″ ht., aprox. 64 oz.